This view of the aurora borealis over Sweden was captured by astrophotographer Chad Blakley. Jaw-dropping displays of the northern lights can be seen in a stunning series of time-lapse videos captured in Sweden this month by astrophotographer Chad Blakley. 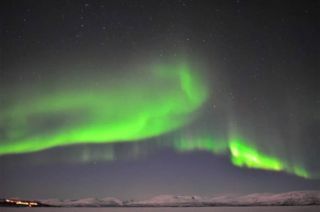 Blakley has been filming in Sweden's Abisko National Park, which offers a view of glowing aurora borealis over snowy mountains. Swooshing and swirling green northern lights can be seen glimmering in a deep purple sky in the videos, which were shot over a 13-day stretch. "We have seen powerful auroras in the sky above Abisko for 13 nights in a row and it looks like there are more to come!" said Blakley, who runs the site LightsOverLapland.com. "Last night I witnessed one of the finest aurora displays I have seen in many months." Auroras are caused when charged particles from the sun are guided by Earth's magnetic field and slam into neutral particles in our planet's upper atmosphere. The magnetic field steers solar particles toward Earth's poles, so the northern and southern lights are best seen at high and low latitudes. Whatever the name, the aurora displays this month have been unforgettable, Blakley said. "February 2013 is turning out to be one of the best months for aurora watching I have ever seen!" he added. Experts predict more and more stunning aurora shows as the sun ramps up toward a period of maximum activity this year, the peak of its 11-year cycle.